DARPA is interested in developing what amounts to an airborne "aircraft carrier" for launching and retrieving drone aircraft. DARPA is interested in exploring the feasibility of small UAS airborne launch and recovery approaches for providing distributed airborne capabilities from existing air platforms. The agency envisions a large aircraft that, with minimal modification, could launch and recover multiple small unmanned systems from a standoff distance. It is postulated that there is a useful trade space in terms of launch platforms; recovery platforms; recovery techniques; the number of UAS employed; the size (and cost) of the UAS; UAS speed, range, and endurance; UAS propulsion; UAS survivability; payload types; and operational concepts. This RFI seeks information on concept feasibility, unique and enabling platform technologies, system architectures, concepts of operation, modeling and simulation, potential demonstration platforms and approaches, and reusable low-cost delivery vehicle (UAS) platform concepts. DARPA is primarily interested in platform-related technologies and concepts. This RFI also seeks rough order of magnitude (ROM) cost and schedule information to assist in planning a potential future DARPA program in this area. In his 2012 thriller Kill Decision, Daniel Suarez introduces the idea of a parent drone that can launch a smaller, special-purpose drone. The concept of a "flying aircraft carrier" still fascinates us. In the Sky Captain and the World of Tomorrow, a 2004 movie directed by Kerry Conran and starring Jude Law and Gwyneth Paltrow, the intrepid Sky Captain runs out of fuel in the middle of nowhere. Fortunately, a huge flying platform commanded by his friend Franky (played by Angelina Jolie) was in the area. This improbably large craft had hundreds of crewmembers with dozens of aircraft; it was kept aloft by large downward-pointing rotors. 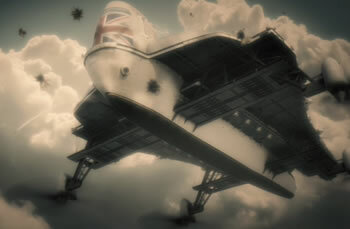 This excellent film was shot almost entirely against a blue background; computer-generated graphics make enormous flying platforms possible in the movies, if not in real life. Take a look at the real-life airship Macon, which was used to launch and retrieve recon aircraft, whose great size and rumbling engines were a familiar part of life to students at Stanford in the early 'thirties.